The mode of tracking affects the amount of incident radiation falling on the collector surface in proportion to the cosine of the incidence angle. The amount of energy falling on a surface per unit area for the four modes of tracking for the summer and winter solstices and the equinoxes are shown in Table 2.2. This analysis has been performed with the same radiation model used to plot the solar flux figures in this section. Again, the type of the model used here is not important, because it is used for comparison purposes only. The performance of the various modes of tracking is compared to the full tracking, which collects the maximum amount of solar energy, shown as 100% in Table 2.2. From this table it is obvious that the polar and the N-S horizontal modes are the most suitable for one-axis tracking, since their performance is very close to the full tracking, provided that the low winter performance of the latter is not a problem. Notes: E = equinoxes, SS = summer solstice, WS = winter solstice. Solar azimuth angle (degree) figure 2.17 Sun path diagram for 35°N latitude. diagram, and to use the diagram to find the position of the sun in the sky at any time of the year. As can be seen from Eqs. (2.12) and (2.13), the solar altitude angle, a, and the solar azimuth angle, z, are functions of latitude, L, hour angle, h, and declination, 6. In a two-dimensional plot, only two independent parameters can be used to correlate the other parameters; therefore, it is usual to plot different sun path diagrams for different latitudes. Such diagrams show the complete variations of hour angle and declination for a full year. Figure 2.17 shows the sun path diagram for 35°N latitude. Lines of constant declination are labeled by the value of the angles. Points of constant hour angles are clearly indicated. This figure is used in combination with Figure 2.7 or Eqs. (2.5)-(2.7); i.e., for a day in a year, Figure 2.7 or the equations can be used to estimate declination, which is then entered together with the time of day and converted to solar time using Eq. (2.3) in Figure 2.17 to estimate solar altitude and azimuth angles. It should be noted that Figure 2.17 applies for the Northern Hemisphere. For the Southern Hemisphere, the sign of the declination should be reversed. Figures A3.2 through A3.4 in Appendix 3 show the sun path diagrams for 30°, 40°, and 50°N latitudes. In the design of many solar energy systems, it is often required to estimate the possibility of the shading of solar collectors or the windows of a building by surrounding structures. To determine the shading, it is necessary to know the shadow cast as a function of time during every day of the year. Although mathematical models can be used for this purpose, a simpler graphical method is presented here, which is suitable for quick, practical applications. This method is usually sufficient, since the objective is usually not to estimate exactly the amount of shading but to determine whether a position suggested for the placement of collectors is suitable or not. The sun path diagram is often very useful in determining the period of the year and hours of day when shading will take place at a particular location. This is illustrated in the following example. A building is located at 35°N latitude and its side of interest is located 15° east of south. We want to investigate the time of the year that point x on the building will be shaded, as shown in Figure 2.19. The upper limit of profile angle for shading point x is 35° and 15° west of true south. This is point A drawn on the sun path diagram, as shown in Figure 2.20. 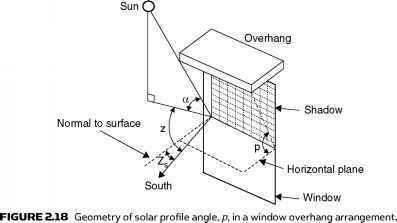 In this case, the solar profile angle is the solar altitude angle. Distance x-B is (72 + 122)1/2 = 13.9 m. For the point B, the altitude angle is tan(a) = 8/13.9 ^ a = 29.9°. Similarly, distance x-C is (42 + 122)1/2 = 12.6 m, and for point C, the altitude angle is tan(a) = 8/12.6 ^ a = 32.4°. Both points are as indicated on the sun path diagram in Figure 2.20. Solar azimuth angle (degree) FiGuRE 2.20 Sun path diagram for Example 2.8. Therefore, point x on the wall of interest is shaded during the period indicated by the curve BAC in Figure 2.20. It is straightforward to determine the hours that shading occurs, whereas the time of year is determined by the declination. 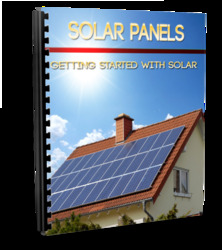 Solar collectors are usually installed in multi-rows facing the true south. There is, hence, a need to estimate the possibility of shading by the front rows of the second and subsequent rows. The maximum shading, in this case, occurs at local solar noon, and this can easily be estimated by finding the noon altitude, a„, as given by Eq. (2.14) and checking whether the shadow formed shades the second or subsequent collector rows. The fin and window assembly are shown in Figure 2.21. Perpendicular to window FIGuRE 2.21 Fin and window assembly for Example 2.9. From triangle ABC, the sides AB = D, BC = w, and angle A is z - Zs. Therefore, distance w is estimated by w = D tan(z - Zs). Shadow calculations for overhangs are examined in more detail in Chapter 6, Section 6.2.5. All substances, solid bodies as well as liquids and gases above the absolute zero temperature, emit energy in the form of electromagnetic waves. The radiation that is important to solar energy applications is that emitted by the sun within the ultraviolet, visible, and infrared regions. 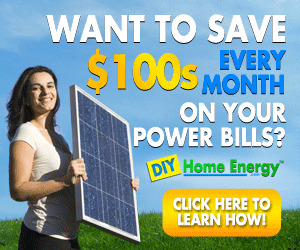 Therefore, the radiation wavelength that is important to solar energy applications is between 0.15 and 3.0 |m. The wavelengths in the visible region lie between 0.38 and 0.72 |im. This section initially examines issues related to thermal radiation, which includes basic concepts, radiation from real surfaces, and radiation exchanges between two surfaces. This is followed by the variation of extraterrestrial radiation, atmospheric attenuation, terrestrial irradiation, and total radiation received on sloped surfaces. Finally, it briefly describes radiation measuring equipment. where pX = spectral reflectivity. aX = spectral absorptivity. tx = spectral transmissivity. The angular variation of absorptance for black paint is illustrated in Table 2.3 for incidence angles of 0-90°. The absorptance for diffuse radiation is approximately 0.90 (Lof and Tybout, 1972). Table 2.3 Angular Variation of Absorptance for Black Paint (Reprinted from Löf and Tybout (1972) with Permission from ASME). regardless of the spectral character or directional preference of the incident radiation, it is called a blackbody. This is a hypothetical idealization that does not exist in reality. EbX = monochromatic emissive power of a blackbody (W/m2-pm). T = temperature of the body (K). X = wavelength (pm). C = constant = 3.74 X 108 W-pm4/m2. C2 = constant = 1.44 X 104 pm-K.
By differentiating Eq. (2.34) and equating to 0, the wavelength corresponding to the maximum of the distribution can be obtained and is equal to XmaxT = 2897.8 pm-K. This is known as Wien's displacement law. Figure 2.22 shows the spectral radiation distribution for blackbody radiation at three temperature sources. The curves have been obtained by using the Planck's equation. FÍGuRE 2.22 Spectral distribution of blackbody radiation. where a = the Stefan-Boltzmann constant = 5.6697 X 10~8 W/m2-K4. which results in -b(0 —> XjT) - —b (0 —X2T). Table 2.4 presents a tabulation of —b(0 — XT) as a fraction of the total emissive power, Eb = ctT4, for various values of XT. The values are not rounded, because the original table, suggested by Dunkle (1954), recorded XT in micrometer-degrees Rankine (|m-°R), which were converted to micrometer-Kelvins (|m-K) in Table 2.4. Equation (2.41) relates the total emissivity and absorptivity over the entire wavelength. This generalization, however, is strictly valid only if the incident and emitted radiation have, in addition to the temperature equilibrium at the surfaces, the same spectral distribution. Such conditions are rarely met in real life; to simplify the analysis of radiation problems, however, the assumption that monochromatic properties are constant over all wavelengths is often made. Such a body with these characteristics is called a graybody. Eb = blackbody emissive power per unit surface area (W/m2). H = irradiation incident on the surface per unit surface area (W/m2). e = emissivity of the surface. p = reflectivity of the surface. There are two idealized limiting cases of radiation reflection: The reflection is called specular if the reflected ray leaves at an angle with the normal to the surface equal to the angle made by the incident ray, and it is called diffuse if the incident ray is reflected uniformly in all directions. Real surfaces are neither perfectly specular nor perfectly diffuse. Rough industrial surfaces, however, are often considered as diffuse reflectors in engineering calculations. A glass with transmissivity of 0.92 is used in a certain application for wavelengths 0.3 and 3.0 pm. The glass is opaque to all other wavelengths. Assuming that the sun is a blackbody at 5760K and neglecting atmospheric attenuation, determine the percent of incident solar energy transmitted through the glass. If the interior of the application is assumed to be a blackbody at 373 K, determine the percent of radiation emitted from the interior and transmitted out through the glass. In addition, the percentage of radiation transmitted through the glass is 0.92 X 94.61 =87.04%. The percent of outgoing infrared radiation incident on the glass in the wavelength 0.3-3 |im is 0.1%, and the percent of this radiation transmitted out through the glass is only 0.92 X 0.1 = 0.092%. This example, in fact, demonstrates the principle of the greenhouse effect; i.e., once the solar energy is absorbed by the interior objects, it is effectively trapped. A surface has a spectral emissivity of 0.87 at wavelengths less than 1.5 |m, 0.65 at wavelengths between 1.5 and 2.5 |im, and 0.4 at wavelengths longer than 2.5 |im. If the surface is at 1000 K, determine the average emissivity over the entire wavelength and the total emissive power of the surface. where n! and n2 are the refraction indices and n is the ratio of refraction index for the two media forming the interface. The refraction index is the determining factor for the reflection losses at the interface. A typical value of the refraction index is 1.000 for air, 1.526 for glass, and 1.33 for water. FiGuRE 2.23 Incident and refraction angles for a beam passing from a medium with refraction index n1 to a medium with refraction index n2.